So if you're like, "Dude, Rebecca...not sure if you know this, but Easter was last week," my answer is, yeah, I know, I know! But Daring Bakers has strict posting guidelines and I didn't want to break them. So sorry that you now have to wait until next Easter to make this bread. Or you could just be a rebel and make it whenever you feel like it. I've been known to do that. Apology: Pictures all taken in ridiculously different lights. 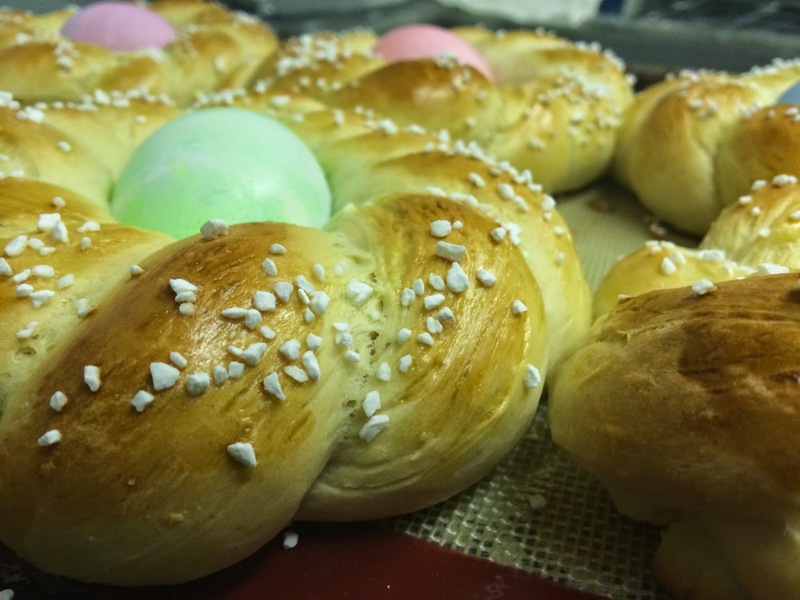 So, Easter Bread. Just your basic enriched dough, twisted into a pretty ring and sprinkled with pearl sugar. What's interesting is that the egg you place in the center is raw and actually bakes with the bread. It was a little weird to dye raw eggs, but everything turned out great! These breads were eaten after Good Friday service while watching Nausicaa of the Valley of the Wind and having a ten person cuddle pile. Best way to do it. Combine the yeast, salt, eggs and sugar in the bowl of a standing mixer. Add the warm milk and half of the flour. Knead with the dough hook until combined. Add more flour gradually until the dough starts to pull away from the sides of the mixer. You may not have to use all of the flour. Knead the dough about 3-5 minutes longer, or until completely smooth and elastic. Combine the egg and 1 teaspoon water in a small condiment cup. Using a pastry brush, lightly coat the loaves with the mixture. Sprinkle on the nonpareils and gently place a dyed egg in the middle of each loaf. Bake for 20 minutes, or until the bread is golden and fragrant. Let cool until warm, if patience allows. I understand the light problem! My kitchen is dark so I try to take my photos in the dining room. But when I want to get a kitchen shot my lighting is off from the other photos. Regardless, your bread looks terrific! Thanks! My biggest issue is that I just don't usually bake when there are good natural light sources, and whatever I make gets eaten so fast I need to immediately take pictures! I love that you made individual wreaths, AND twisted them as well. They look adorable! Yes, your Great Grandmother would be proud!